The sun came out for Amelia’s big day! Oh, it was Casey and Dayna’s big day, too! It was happiness for me to road trip it to Tacoma on the morning of July 26th to celebrate Casey and Dayna and to share in their wedding ceremony at the Japanese Reconciliation Park on Ruston Way. Over a number of months, it was such a pleasure to work with Dayna and Casey, as we designed their ceremony and worked through ceremony and pre-planning logistics. And all of Dayna’s planning work paid off in a big way. Guests were elegant welcomed. All pre-ceremony pieces were in place. And we had such a happy bride and groom to get so very married on a hot July day! 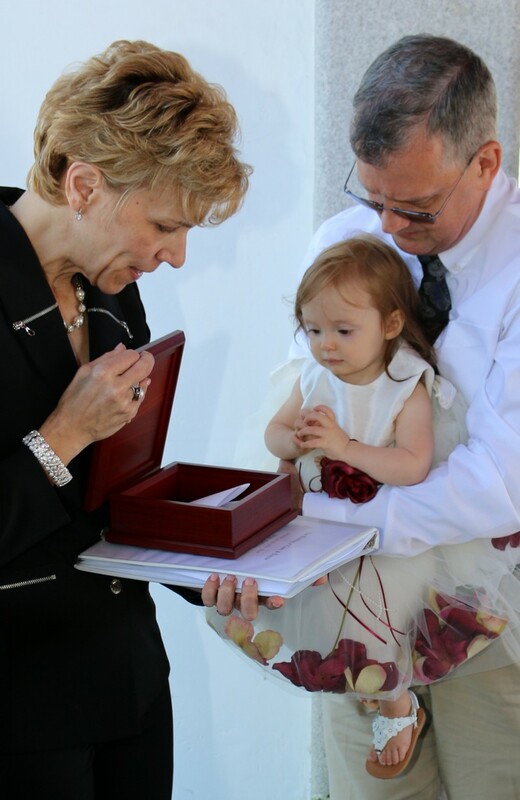 Incorporating children into a ceremony is a gentle art and dance. In this work that I do, I strive to be “real” and not preachy when it comes to honoring a child or children within a marriage ritual. On this day, I walked away from Casey and Dayna during ceremony and got down on Amelia’s level to share some words to her. And magically, I was able to make a “keepsake box” appear with a special letter written by her parents that will be given to Amelia on a very special day, years down the road. Casey and Dayna – I wish you so much love, joy and happiness on your marriage and family adventure!